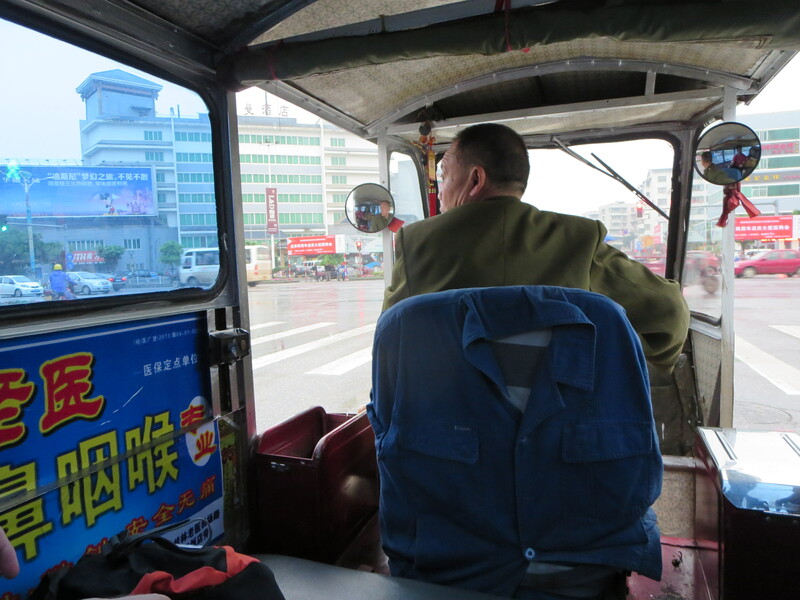 At 6:30 pm, we hopped on a bus and headed for Guilin. Of course, this first bus wasn’t actually the bus that would take us to Guilin, no, instead the bus company opted for the “take the customers via city bus to a different location” route, and after about twenty-thirty minutes on the first bus, we arrived at the inter-city bus station, where we were allowed to board the real land barge that would go the true distance. It was a pretty big bus, but I’m also a pretty big guy, so I got the special seat, at the very end of the aisles, which didn’t have any barrier that would obstruct the hanging of my feet. Adrianna, myself, and about 8 other people were the sole passengers on this bus meant to hold about fifty people (three rows of single beds, each two high). 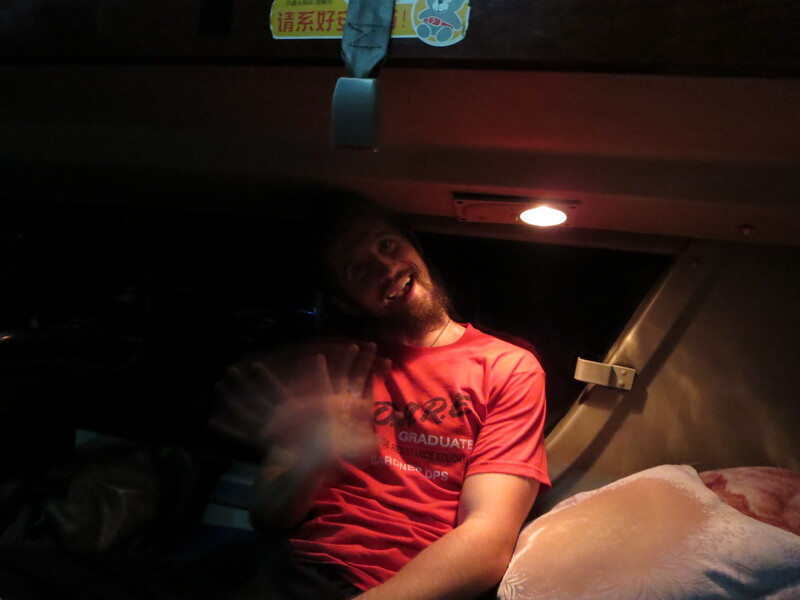 We were optimistic, considering how we had heard that Chinese buses can be hellishly crowded, uncomfortable, and insane. If these were our only traveling companions, then all would be well. All was not well. By the time our bus finally left the station at nearly 8pm, we had settled in and were getting ready for twelve hours on the road. Imagine my surprise when the bus, after closer to 30 minutes on the road, pulled over, with its stop sending my bed inching forward out of its designated enclosure. I looked up to see new friends joining our party! No problem, I thought, it’s only a few people; there are still plenty of beds. Surely we won’t fill up every single space on the bus. I had a vested interest in at least one space remaining open, you see, for my sleeping situation was unique. In the very back of the bus was a special, five wide arrangement (one bed against each wall, one in each aisle, and one in the middle). Adrianna and I had claimed one half of this, and another foreign couple the other, leaving the middle bed as a nice little island where we could put some stuff, occupy extra space, and generally be larger than the average Chinese person. My interests, unfortunately, did not win out. 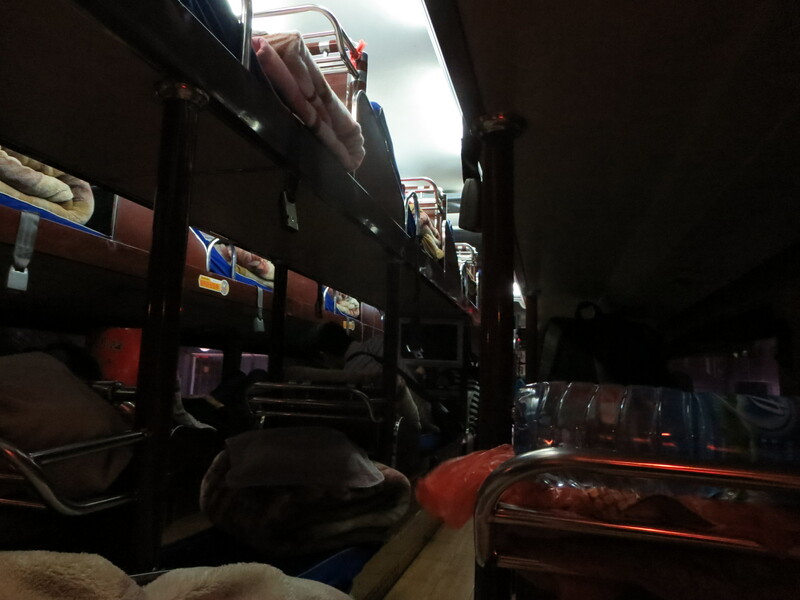 Our bus continued to make stops nearly every half hour, awakening me–fear of my slim mattress escaping its bounds–and adding another two, three, or four passengers. As it became tighter and tighter, our buffer zone, our oasis, was in more and more danger. At long last, around 12:30am, we made our final stop and our island of calm was shattered as a young man who must have been desperately in love found himself stuck between two foreign couples. How did I know he was in love, you ask? Oh, probably because he spent the better part of an hour chattering away into one of those new cell phones, you know, the ones the size of his face, to a person I assume was his lover. Who else would he be talking to that late at night? Though our privacy was lost, we gained something else. With the bus full, we made no more stops until about 5 am, when we pulled into Yangshuo (another common tourist city just downriver from Guilin). This wakeup call was the last one necessary, and the final 90 minutes I sat awake, eating peanuts and listening to Stranger in a Strange Land, by Robert Heinlein, on my iPod. Fitting, isn’t it? When pulled into our destination, disembarked, evacuated our full bladders, and grabbed a pseudo-cab into the hotel. Pseudo-cab (n) – a motorcycle with a passenger space attached to its rear end, allowing the driver to shuttle passengers slowly to their destinations for a fee. We reached the hotel, too early to check in, dropped some of our heavier bags off, and spent the next two hours walking around and eating breakfast. From what I’ve seen so far, it’s quite the pleasant city. Buildings here, unlike Shenzhen, are generally more than 30 years old, so it’s a breath of fresh air when you walk around and feel like the things in front of you have been there for at least a little longer. We did finally check in, and the first order of business was a nap. Where we go after that, only time will tell. We took the train – which was shared space and cramped but more spacious than yours! We quite enjoyed Guilin (and Yangshuo) and hope you do too. We always wanted to go there but never made it. Have fun and take lots of pictures and videos. Sounds like Harry Potter’s bus. That was also my first thought. The Harry Potter thing.